The end of the 1800s and early 1900s was a time when many women trained to be painters, and pursued successful careers afterwards. Although most are completely forgotten now, two of the more eminent of William Merritt Chase’s pupils were Ella Sophonisba Hergesheimer and Dora Wheeler Keith. 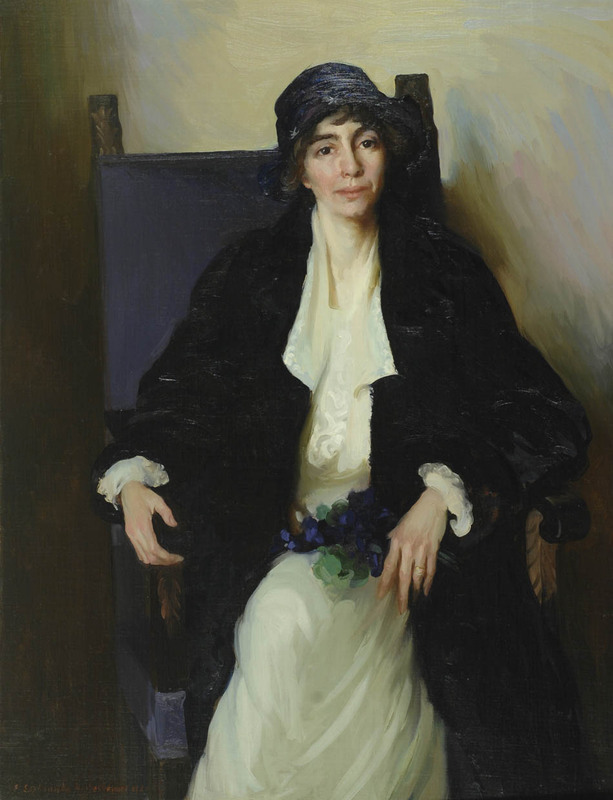 Ella Sophonisba Hergesheimer (1873-1943) was born in Allentown, Pennsylvania, and initially trained at the Philadelphia School of Design for Women, before moving on the Pennsylvania Academy of Fine Arts, where she was taught by Cecilia Beaux and William Merritt Chase. In the summer of 1900, she attended Chase’s summer school in the Shinnecock Hills of Long Island. She excelled at the Pennsylvania Academy of Fine Arts, and was awarded the Cresson Travelling Scholarship as the best in her class. That took her to Europe for three years, where she studied at the Académie Colarossi in Paris. She was successful in exhibiting in the Paris Salon too. Following her return to the US, in 1907 she moved to Nashville, Tennessee, and taught in Bowling Green, Kentucky. She was a notable portraitist there, and pioneered the white-line woodcut in print-making. Her best-known portrait is that of the Speaker of the House Joseph W Byrns, Senior, (1937), which hangs in the US Capitol building. Unfortunately a suitable image of that is not available for use here. I have only been able to locate two good images of her many portraits, and one of a still life. Ella Sophonisba Hergesheimer (1873-1943), The Old Tea Pot (date not known), oil on canvas, 61 x 76.2 cm, Johnson Collection, Spartanburg, SC. Wikimedia Commons. Madeline McDowell Breckinridge (1872-1920), painted in 1920, shows this leader of the women’s suffrage movement and one of Kentucky’s leading progressive reformers. She suffered from tuberculosis for much of her life, and died in 1920 at the age of only 48. Ella Sophonisba Hergesheimer (1873-1943), Portrait of Commodore Matthew Fontaine Maury USN (1923), oil on canvas, dimensions not known, United States Naval Academy, Annapolis, MD. Wikimedia Commons. 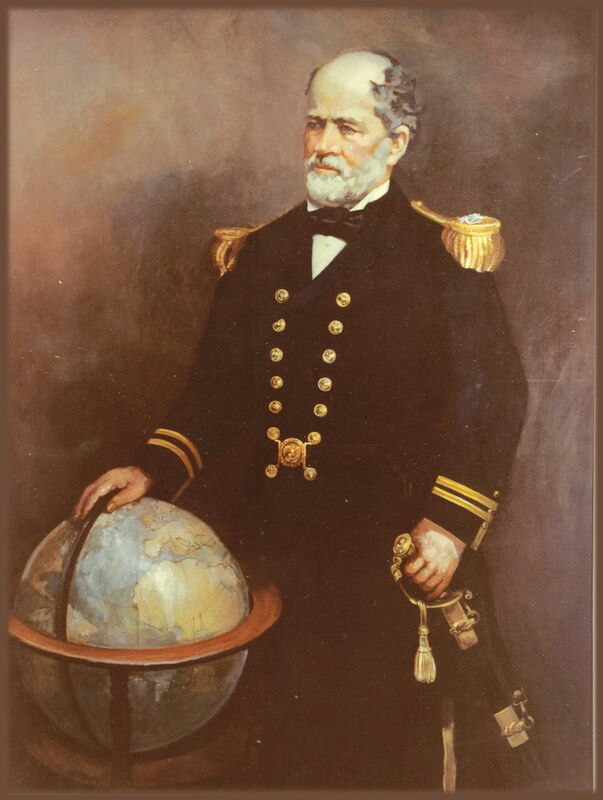 Portrait of Commodore Matthew Fontaine Maury USN (1806-1873), painted in 1923, shows one of the founders of modern oceanography and naval meteorology, who was Superintendent of the US Naval Observatory, and one of the founders of the American Association for the Advancement of Science. Dora Wheeler Keith (1857-1940) was born on Long Island, New York, to a mother (Candace Wheeler) who was an author, entrepreneur, and expert on decorative textiles and interiors. She moved with her family to Europe after the Civil War, and was educated in Wiesbaden, Germany, summering in Montreux, Switzerland. Family friends included Frederic Edwin Church, Sanford Gifford, Albert Bierstadt, George Inness, and J Alden Weir. She was taught by William Merritt Chase from 1879-1881, one of his first pupils, and he remained her mentor. She went on to study at the Art Students League in New York, then spent two years at the Académie Julian in Paris. In 1885 she completed a design of Penelope Unravelling her Tapestry at Night, which was made into a tapestry by her mother’s company, Associated Artists, and is its only surviving major tapestry. She undertook illustration work from 1881, then progressing to portraits of literary figures including Harriet Beecher Stowe, Mark Twain, and Walt Whitman. In 1890 she married a lawyer, Boudinot Keith (1859-1925), and is sometimes known under her married name of Mrs Boudinot Keith. Few of the tapestries which she designed have survived, and a large canvas ceiling mural which she painted for the World’s Columbian Exposition in Chicago in 1893 has disappeared. Thankfully several of her portraits survive, although very few appear particularly accessible now. 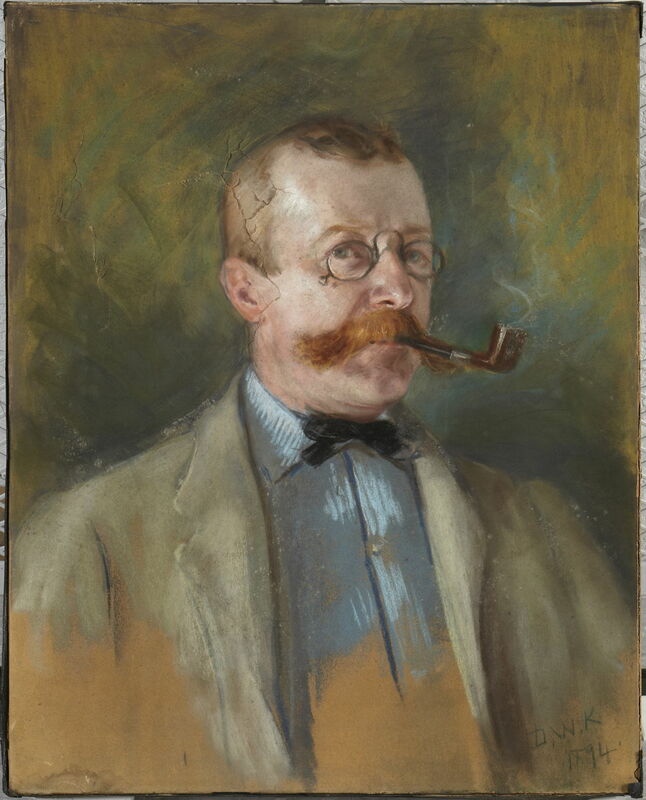 Dora Wheeler Keith (1857-1940), Portrait of Henry L Stimson, aged approx. 12, with Mimi the Cat (c 1879), oil on canvas, 35.6 x 43.8 cm, location not known. Wikimedia Commons. Portrait of Henry L Stimson, aged approx. 12, with Mimi the Cat, was painted in about 1879. Stimson (1867-1950) went on to become the US Secretary of War 1911-13, and again in 1940-45 under Presidents Roosevelt and Truman. Dora Wheeler Keith was his aunt. 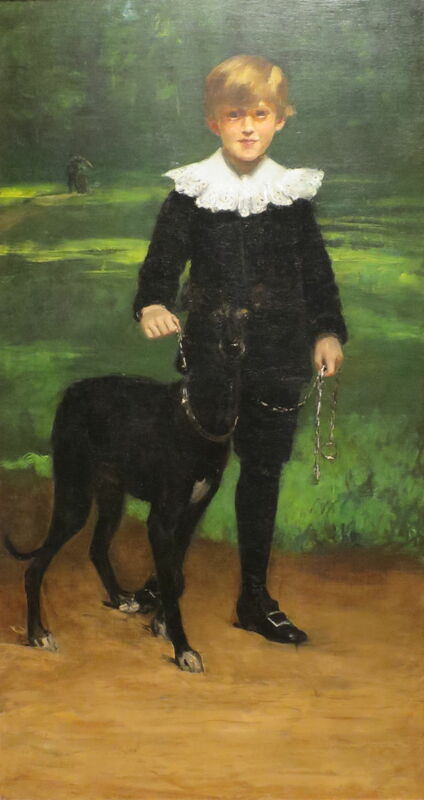 Dora Wheeler Keith (1857-1940), Boy with a Dog (c 1881), oil on canvas, dimensions not known, High Museum of Art, Atlanta, GA. Wikimedia Commons. Portrait of Laurence Hutton, 1843-1904, was painted in pastels in 1894. It shows this essayist and critic, who was for many years the literary editor of Harper’s Magazine. Posted in General, Painting and tagged Beaux, Chase, Hergesheimer, Keith, painting, Wheeler. Bookmark the permalink.